Beaufort Academy is offering a new program of week-long summer camps for ages 2-18 starting in June. Beaufort Academy Summer Enrichment Programs provide an opportunity for every camper to develop skills and interests in a variety of areas. Enrollment is open to all in the community and are co-ed unless otherwise noted. Enrollment is limited and will be on a “first-come, first-served" basis. We welcome friends, neighbors, Beaufort residents and visitors! As camp sizes are limited, we encourage early registration. Please provide lunch for your child for full day camps if not included in description. Payment is required along with the online registration form to reserve a space in the Summer Camps. If camps require additional forms to be completed, refer to the sidebar for those documents. Come join us for 4 weeks of summertime fun in the BA Preschool! Beaufort Academy is offering a half day themed camp for student’s ages 2-5. Your little ones will love being at BA preschool camp with some of our favorite teachers! Enrollment is open to the entire community and is co-ed. Enrollment is limited and will be on a “first-come, first-served" basis. To secure a spot, register and pay online here up until May 15th. As camp sizes are limited, we encourage early registration; registration will close as camper limit is reached. Students have the option to bring their own lunch, or choose to purchase lunch for $4 per day. Register & pay online here to reserve your spot. Lunch: Campers can bring their own lunch or can be pre-ordered through Beaufort Academy for a fee of $4 per day. All snacks and drinks will be included in camp fee. Get ready for the best summer yet! 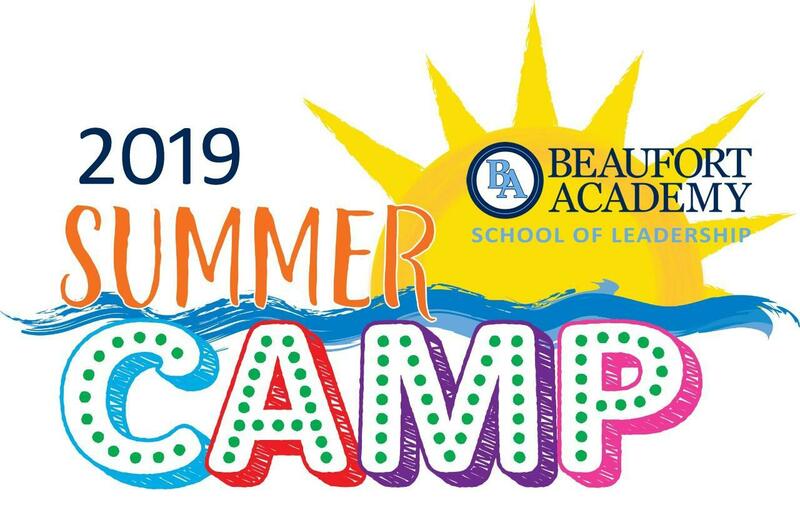 This year Beaufort Academy is hosting full-day themed summer enrichment camp for children in grades rising 1- 4 and it’s jammed packed with summer fun you will not want to miss! Our 8 week program is uniquely themed with field trips, indoor/outdoor games, team building activities, crafts, camper led exhibits, end of the week assemblies, and more! Enrollment is open to the entire community and is co-ed. Enrollment is limited and will be on a “first-come, first-served" basis. To secure a spot, register and pay online here up until May 15th. As camp sizes are limited, we encourage early registration; registration will close as camper limit is reached. Camp T-shirt and field trips are included in camp registration. Register & pay online at here to reserve your spot. Lunch: Campers must bring in their own lunch, snacks, and water bottle. Join us for a week of imaginative and colorful seaside crafting. We'll be making paper ships, painted fish, seashell ornaments and many more projects that immerse us in driftwood, shells, sand, and sea! Snacks provided. Ages Rising 2nd- 6th graders. For over 15 years, VeryVera Cooking Camp has provided a unique summer camp experience for children ages 6-10. Students attend a one-week session where they master cooking skills, etiquette, and life lessons that will create “layers of success” for their future. Beaufort Academy is excited to be hosting the VeryVera camp for students ages 6-10. Four weekly VeryVera Cooking Camps will be available this Summer in two different cooking levels; pre-beginner and beginner. VeryVera Cooking Campers spend 5 days learning about food, getting hands-on in the kitchen, packaging their treats, and learning entrepreneurship in the process. Practicing and understanding the importance of etiquette and teamwork are incorporated into the daily activities. The class will run Monday through Friday of the designated week. All week, the students will be preparing for our Brunch/Lunch Banquet on Friday and serving their special guests using all the manners and etiquette learned throughout the week. On Friday, campers can invite one adult guest to the Brunch/Lunch Banquet. This is a great experience for all kids, and we are so happy to be the exclusive host in Beaufort, SC. Camp will take place in the Beaufort Academy cafeteria and kitchen. Registration is now OPEN for students ages 6-10. Only 12 spots available per week. **If your child is not a Beaufort Academy student with a valid physical on file, please contact the Camp Instructor or Coach by email summerprograms@beaufortacademy.org for a medical form to be completed by your physician. A copy of the medical form is attached on the sidebar. The objective of the football camp is to teach and improve various football skills and generate interest among thr youth in Beaufort towards the sport of football. Offense instruction to include: stances, starts, and releases, blocking fundamentals, run/pass blocking, snapping, ball carrying techniques, receiving techniques and routes, speed and agility. Defense instruction to include: stance, footwork and takeoffs, run blocking and pass rush, speed, agility, and quickness, pass coverage, alignments, formations, and play recognition. We can't guarantee that the Beaufort Academy Football camp will make you an All-American, but we do promise that you will become a better player and perhaps even have a better attitude that will help you in everyday life. We want camp to be the beginning of longtime positive relationships with our future athletes and their families. Ages 11-13 Camp: This camp works on the basic volleyball skills and rules to include; serving, passing, setting, hitting, blocking and court movement. This will be done through a variety of fun and challenging drills and games. The last hour of each day will place the kids into teams with scrimmages. The last day of camp will consist of games and skill challenges for created teams to help crown the camp champs. Ages 14-18 Camp: This camp is aimed towards more advanced skills and game time situations. Players will work on specialized skill sets based on their positions as well as developing their overall skill level. Last hour of each day will involve placement onto teams for scrimmages. Friday will be a mini tournament between teams to crown the camp champs. **Girls may request to attend a different age group based on their skill level and experience. You can contact Coach Carol Meegan to discuss this option. Who: Girls rising 1st through 12th grade students, and Boys rising 1st through 7th grade students. Cost: SESSION 1 - BA students: $60 each week. Non-BA students: $75 per week. SESSION 2 - BA students: $55 each week. Non-BA students: $70 per week. SESSION 3 - BA students: $35 each week. Non-BA students: $45 per week. Camp t-shirt included in each session. The Summer basketball camp will consist of fundamentals for shooting, dribbling, playing defense, one on one situations, mental toughness and technical development through small sided games. Each class will consist of a learning module, development module and a game situation. Prizes awarded daily! Please provide drinks/snacks, appropriate basketball clothing/footwear including a change of clothes. Deadline for sign up is May 17th, 2019. A $20 late fee will be added if later. No discounts apply after the deadline day. No refunds for classes missed. Who: Rising 4th through 9th graders. Cost: $65/$80 per session, or $200 for all 3 sessions, t-shirt included. The purpose of our camp is to teach and develop fundamental offensive and defensive basketball skills, sportsmanship, team play and leadership. The campers will participate daily in agility and conditioning drills, stations to develop fundamentals, free throw contests, 3 on 3 games and 5 on 5 games. Water/Gatorade will be provided at all times. The final day is reserved for a 3 on 3 tournament, a Free Throw Championship, and a 5 on 5 Tournament. Current and Former Beaufort Academy Coaches and Players will be on hand.